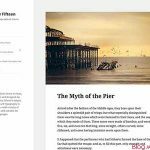 Interesting appearance of new Distraction Free Writing is one of new features seen and explored on WordPress 4.1 beta 1 development version. What else? Unlike the dark color of the old pointers, now with the Release Candidate WP has changed its admin pointers, including the new icons seen on WordPress 3.3 RC 1.